There are certain apple varieties which can be used to plant along the edge of a bed, or next to a path. The trunk of the apple tree runs horizontally at something like 8 inches above soil level. The formation of this tree form can be done in various ways. However the most important requirement is that the formation pruning is never carried out during the winter months when the trees are dormant. 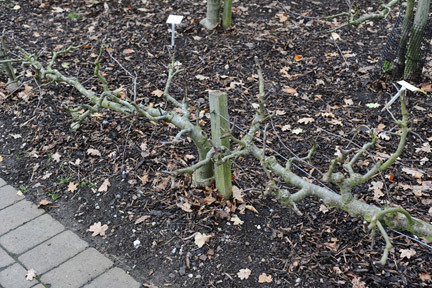 Various stages of summer pruning are carried out, in order to encourage formation of fruit buds all along the main stem. Secondly, ideally, moderate new growth needs to occur along the whole length of the stem. Depending on the soil depth and soil quality, the rootstock suitable for these types of trees are M9 and M26. Tip bearing varieties are not suitable, nor are very vigorous varieties. Spur type varieties are the most useful ones to use for this type of tree. Good results have been achieved by the use of the following varieties: James Grieve, Katy, Greensleeves, Egremont Russet, Lord Lambourne, Ellisons Orange, Sunset, Pixie, Red Pippin, Red Falstaff and Royal Gala. Ideally the two newly-formed main branches should be of the same thickness and the same length. This can be achieved by pruning the tree back, after it has been planted, at a height of approx. 10 inches. 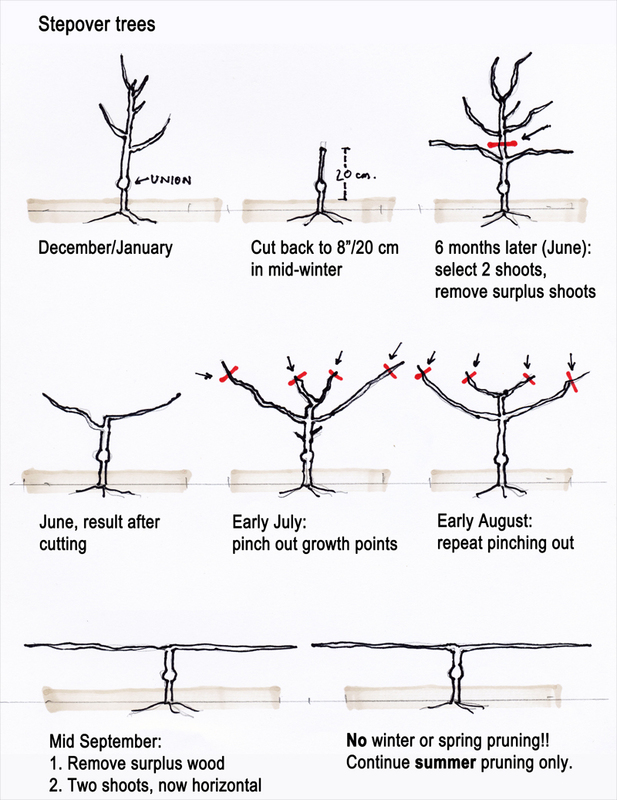 Of the new growth appearing in the early summer months, two shoots running parallel with the edge of the bed, need to be selected and the remaining shoots rubbed out, early during the growing season, early in June. These two shoots should be left to grow, uncut, but gradually lowered to a final horizontal position by the end of September. The following season one will see new growth appearing all along the horizontal branches. It is very important to pinch out the growing tips of the newly forming shoots as soon as 6 inches of length has been established. By the middle of July these shoots are cut back again to 4 inches. New growth will occur again. The shoots are now cut back again, by the middle of September to 2 inches in length. All being well, fruit buds have now been formed along the base of the main horizontal stem. The trick is to make sure these fruit buds set fruit the following season. This can be achieved by making sure good cross pollination occurs every new season. For that reason two compatible diploid varieties need to be planted The stepover trees should be planted approximately 5 to 6 feet apart, depending on the quality of the soil and the rootstock used. There is another method of growing stepover trees. I have often seen heavily laden mature fruit trees that have been blown over by strong gales, level to the ground. As long as 10% of the roots are still undamaged, these trees may start a new life, with the trunk actually lying on the ground. This knowledge can be used with good effect for the construction of stepover trees. As long as trees are well watered and fed, sizeable containers can be used, from which two young maiden trees can be planted, WITHOUT HAVING TO CUT BACK THE TREES. It is essential that these containers have large sized drainage holes from which new roots can find their way into the soil. Often the new shoot growth occurring along the full length of these trees, is easier to control, compared with the treatment of the trees as outlined above.